Wow! Wow! Wow! Viwawa's first ON-SITE tournament! Coming on 21st December 2008, Viwawa's very first LIVE tournament that's not online. 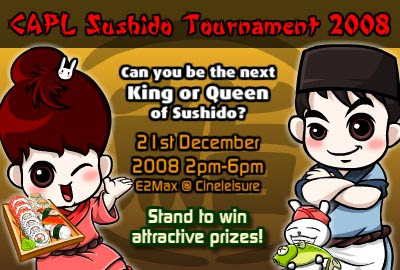 This is when the King and Queen of Sushido will be crowned. Attractive prizes to be won too! Shiok! how many tables can we use? "Exclusive CAPL Sushido Tournament Wawa part for Final 16" - till now i still haven seen it. e-mailed admin twice about this twice no reply. whaz happening to this offer promise? Pls.. give us qualified participants an answer.